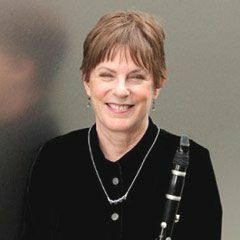 Michele Zukovsky, adjunct professor, winds and percussion, is principal clarinetist with the Los Angeles Philharmonic. She has appeared frequently at the Hollywood Bowl and the Los Angeles Music Center, and she has been a guest soloist with orchestras throughout the world. She toured with Pinchas Zukerman in Australia and, in June 1991, she gave the world premiere of John Williams’ Clarinet Concerto with the Boston Pops. Ms. Zukovsky performs regularly at the Los Angeles Philharmonic’s Chamber Music Society concerts and she has participated in a number of premieres with the New Music Group series. She collaborates with a number of chamber ensembles, most notably the Angeles Quartet. She has appeared at James Levine’s Ravinia Concerts in Alice Tully Hall, Concerts at the Y, at the Mostly Mozart Festival and with the Lincoln Center Chamber Players.